The Carl Duisberg Training Center Cologne is centrally located on the edge of downtown Cologne. We are just a short walk away from the Rhine and Cologne Cathedral, the picturesque historic district, and the pedestrian zone for shopping. We are close to public transport, with subway and tram stations within walking distance. Our language school in Cologne has 16 classrooms, most of them air-conditioned, and a “Lernstudio”. The cafeteria has vending machines serving hot and cold drinks as well as snacks, plus a microwave. There is a public college cafeteria nearby, as well as numerous inexpensive cafés and restaurants. Cologne, with just over one million inhabitants, is a cultural and economic center in the Rhine region. The city owes its international flair to its many tourists and to students from all over the world, who wish to study at one of Cologne’s numerous universities. The cathedral city is especially popular with young people as it has so many leisure activities to offer. The whole year through there are many attractions such as Cologne Carnival (also fondly known as the 5th season by the Cologne folk), the annual Rhine firework display, Christopher Street Day as well as many other music and theater festivals. A visit to one of the many important museums, or the Philharmonic, rounds off the cultural experience. The most outstanding sight and the city’s landmark is of course, and will always remain Cologne Cathedral, which in 1996 became a world heritage site. Starting with the Romans, Cologne can look back on over 2000 years of history; you can come across well preserved remains of this throughout the city. As Germany’s most important media center, this Rhine city is host to the largest German radio and television broadcaster, as well as many private television channels, film and television production companies. Distinguished companies like Ford, Bayer and Microsoft are all situated in this region. Throughout the year visitors to the Cologne trade fair can visit prestigious international trade fairs like Art Cologne. After so much art and culture, those who just want to relax in the evening, can drink a Kölsch beer in the romantic, historic district directly on the Rhine, or in one of the traditional beer houses. There are plenty of opportunities to relax or to do sports in the extensive parks and green areas, often directly on the Rhine. The Romantic Rhine with its palaces and castles is not far away and beckons you on a boat trip. You can combine a trip to the Mosel with a wine tasting session. Cologne is also an ideal starting point for a weekend trip to Paris, Brussels or Amsterdam. The minimum age for the Intensive Course 24+6 is 16, in Radolfzell 15. Participants with prior German language skills may begin a German course on any given Monday. The start dates for beginner courses are listed in our brochure. Als anerkannter telc-Lizenzpartner bieten Ihnen die Carl Duisberg Centren eine kompetente und umfassende Vorbereitung für die Prüfung telc Deutsch C1 Hochschule in Berlin, Köln, München und Radolfzell am Bodensee. Die Prüfung ist als Nachweis von Sprachkenntnissen für ein Studium in Deutschland anerkannt. erlernen, auch anhand von Modellprüfungen, jene Strategien und Techniken, die Sie zur effektiven und erfolgreichen Lösung der Aufgaben benötigen. Nach Abschluss der Vorbereitung haben Sie die Möglichkeit, die Prüfung telc Deutsch C1 Hochschule direkt im Carl Duisberg Centrum abzulegen. We offer a range of programs to successfully kick off your studies in Germany. Applicants who have been accepted directly at a college or university will be prepared for the language examination required for their university admission. If you are required to attend a “Studienkolleg” before commencing your studies, our special courses will prepare you for the entrance exam or external assessment exam. 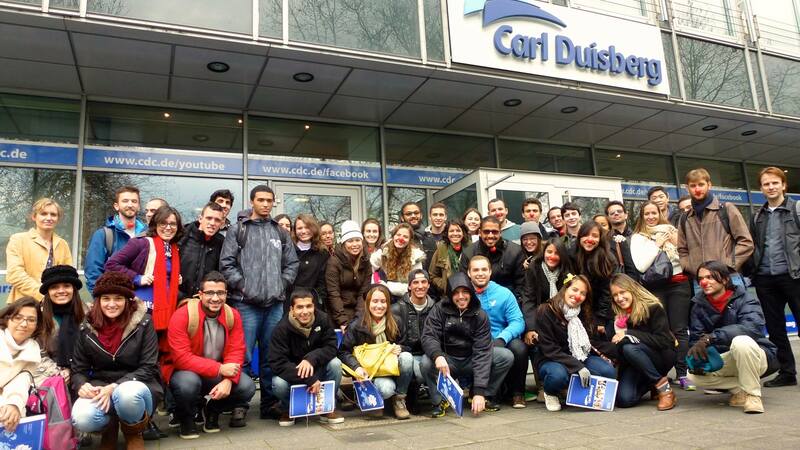 Carl Duisberg Centren offers German intensive courses at four great locations. All of our high-quality language courses feature qualified instruction by way of an efficient, communicative teaching concept and modern classrooms. Our courses are the perfect way to prepare for the language entrance exam. You may also take the TestDaF and telc C1 Hochschule exam directly at one of our centers. In this ten-month foundation course in Cologne, you acquire the knowledge you need for your future field of study. The curriculum corresponds to the subjects taught at State-run &quot;Studienkollegs&quot; and ends with an external assessment exam. After you have passed the exam, you may enroll at a college or university in Germany. You must book a three-month German Intensive Course in order to take part in this program. When you book a German Intensive Course (min. 12 weeks) at Carl Duisberg Centren, we help you apply to at least three colleges/universities or a State-run &quot;Studienkolleg&quot;. Our professional educational counseling increases your chances for successful admission. We take care of the formalities so that you can focus on your language preparation studies. Not only was Köln an amazing place to spend 2 months over summer, but I also had the opportunity to study German at CDC. From the first moment inside the building I started to meet friendly people from all over the world. All of the staff at CDC Köln are friendly, patient and very passionate about building cultural bridges through language learning. My teacher Dr Jochen Becker is probably the best language teacher I've ever had. Like him, I also heard from other students that they found their teachers to be friendly, enthusiastic, and patient. As well as having a strong command of teaching pedagogy and of course German. Like all the other students who were at CDC in preparation for studying at a German, university thanks to DAAD, I am very grateful for the opportunity and only wish that I could have stayed longer at CDC in Köln.